been going on in my life. An unexpected journey began at the end of August and has led me down a road I would rather have not travelled. I've been diagnosed with metaplastic breast cancer and have had a masterctomy of my right breast. Chemo will follow and perhaps radiation. Dishes have taken a back seat in the grand scheme of things. I do appeaciate your caring messages, but am unable to answer each one individually. Oh my goodness -- heartfelt prayers for a complete recovery. Keep us up to date whenever you can, and we all look forward to your return to blogland, completely healthy and cancer-free. Hugs and best wishes! Prayers for your complete recovery. Wishing you a speedy recovery Candy, please take care! Fight the fight, dig out the strong, and let the blessed energy of all your friends, family and blog family fill you with the energy you need! We will await your next post. I have missed you, sad news but you can win this. Good thoughts your way, take care or yourself. Know that all the beauty and enjoyment you've shared has touched many, many people -- and we're sending it back your way in thoughts and prayers and thanks. Best wishes for a steady and complete recovery. I was afraid of something like that, with the lack of posts! Please take care of yourself, your health is of the utmost importance. Best wishes for a speedy and complete recovery! So sorry to hear this news. Praying for a full and speedy recovery! I am just seeing this Candy! I wish you well and will pray for your complete recovery! Stay strong, I know it is difficult. My 40 y o niece went through this 2 years ago and is doing well. Hoping you are doing well. Your blog is beautiful. I hope that you are feeling strong and getting better each day. Healing wishes to you! I wish you the best on this journey rather not taken. I hope you dream up some wonderful tables while go through the necessary torment. Prayers are being sent your way. Hope you'll be back with us soon. I am sending heartfelt prayers for a complete recovery. You are missed by us all with your Gorgeous Tablescapes, please keep us up to date whenever you can, and we all look forward to your return to blogland, completely healthy and cancer-free. Hugs and best wishes! God Bless and prayers are coming your way. Checking in and wanted to let you know that you re-ignited my passion for Fiesta and tablecloths vintage or new. Your blog is a treat of loveliness and creativity. I have purchased 4 Fiesta tablecloths last summer based on your blog and happily found matching dish towels are now offered at Kohls (probably at Macys too). You remain in my prayers for a full recovery! Sending good thoughts, and hoping you are doing well. 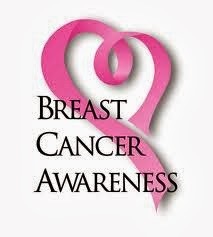 I'm a breast cancer survivor, myself. Was thinking about your this morning - hope you're doing well. I just learned you have been so ill. I am sending all good thoughts your way and hope you are over the worst of it. I have always enjoyed your hobbies so much! Thinking of you! Spring will be here soon and I am sure you will feel so much better as things start to grow, leaf out and your roses bloom. Kelley from Daves Garden sends you love! I am sorry to see this post. I hope you are doing well and I hope we'll see you back at the little round table soon. Good thoughts and prayers going up for you. I just saw this post and was so sorry to hear of your breast cancer. I hope by now that your treatments have finished and that you're feeling stronger.You are missed. Hadn't seen any posts from you in awhile and had missed your beautiful tables and tablecloths, so I thought I'd check in and was stunned to see that you have been battling cancer. I'm so sorry to hear that and will be praying for you, that your treatments are successful and that you will be restored to health. Many good wishes coming your way! Thinking of you and praying for you! Good to see an update. You will be back at your little round table working your magic, I just know it!